Click here for the schedules of the various institute and project colloquia. Click here for more information on the planned theme "Climate Change - Geoscientific Perspectives"
Future Earth - Future Ocean: Why should we be interested in integrated sciences? 30 Nov 2015 Prof Susan Waldron University of Glasgow, United Kingdom In the anthropocene slow carbon cycles are becoming faster. How do we know? The aim of the lectures is to achieve a deeper understanding of current developments and larger trends across the spectrum of the geosciences that affect our society. All topics will be discussed in a broader societal context. 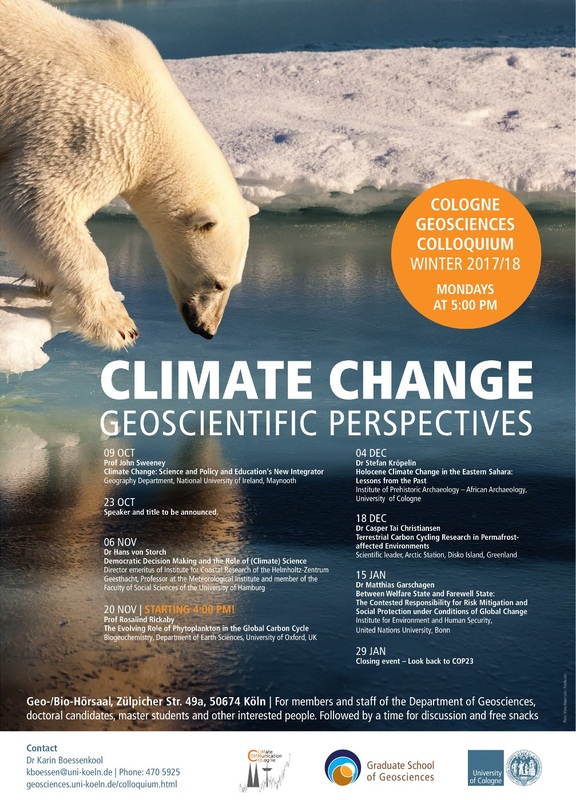 The series is open to everyone in Cologne Geosciences, students and university staff and to members of the regional geo-alliance Geoverbund ABC/J. Students from across the university can partake in the module "Future Earth" offered as a part of Studium Integrale (details are available on the webpages of the Professional Center). This series was initiated and is co-organised by the GSGS Debate Club, a bottom-up initiative of doctoral student members of the Graduate School of Geosciences. 24 Nov 2014 Dr Stephan de Roode Delft University of Technology, The Netherlands What controls the stratocumulus cloud amount?